Blog — Brandenburg Bakery, Inc.
Christmas is right around the corner, and few other holidays have as many delicious and classic treats that represent the season. In Germany, the season is taken very seriously, and hundreds of years of history have created myriad cookies, breads, and other tasty goods just for the time of year when things get cold, the fires get warm, and the Feuerzangenbowle pours freely. Brandenburg Bakery makes many specialized german cookies for the Christmas season, all hand made from scratch right in the bakery. Reindeer Treats, or Basler Leckerli, are a traditional treat from Basil in Switzerland, first created over 700 years ago. Flat baked honey dough is cut into rectangles, and liberally covered in sugar glaze and chocolate. Made with honey, almonds, and Kirschwasser, a liqueur, make these amazing cookies oh so delicious. Reindeer Treats. Don't feed them to your reindeer. They were made just for you. The Pfeffernuss, a heavily spiced holiday cookie, made from honey dough. Oddly, the name means peppernut, but there is no pepper in them at all—likely a holdover from earlier times, when many spices like cinnamon and clove were called 'peppers' as a group, and the name stuck around. They are a popular holiday treat in Germany, Denmark, and The Netherlands. These are delicious treats, spiced with cinnamon and other holiday spices, and certainly make for wonderful gifts for the season. Almond Crescent, or Vanillekipferl, look just like their name sounds. Medium sized crescents, sprinkled with vanilla sugar (see here for some shots of that vanilla sugar!). They are a specialty of the Bavarian town of Nördlingen, and is a difficult cookie to make. The shaping of the fragile batter takes a steady hand and concentration. Their distinctive shape may be because they were created in celebration of the Hungarian army defeating the Turkish, as the Turkish flag has a crescent moon on it. Well, at least one good thing came of that! Ground almonds and vanilla extract, plus the vanilla sugar, make these cookies taste as good as they look. Cinnamon Stars. These cute little treats are naturally gluten free, being made from almond flour, egg whites, and cinnamon. Topped with a light meringue, cinnamon stars are as sweet as they look, with that wonderful seasonal cinnamon flavor throughout. Elisenlebkuchen is originally from Nuremberg, Germany, these soft and moist cookies are almost entirely made of nuts and are dipped in chocolate, making them very special. Sweet, with a spicy aroma, and a light nutty taste, and containing bits of candied orange and lemon, you may find these cookies your very favorite for the holidays. See those delicious looking chocolate cookies to the top left? Elisenlebkuchen! Lebkuchen! This is far and away from what we in the U.S. might call gingerbread, and this classic recipe is made to the same specifications as the Pulsnitzer Pfefferkuchen, a very special and specific recipe made with a honey starter dough that ages for weeks before use. Butter, eggs, cocoa powder, and plenty of holiday spices make for a balanced and delicious cookie. This traditional german treat is what we use for our gingerbread men and gingerbread houses, and we think you'll find it a sweet and wonderful addition to your holidays, simply not overloaded with a ton of ginger like some other cookies you may find this time of year. Those gingerbread men are happy. We swear. Gingerbread Houses! What would the season be without gingerbread houses? These take a long time to make, spanning a few days and many, many steps, but we think they are beautiful. Starting with the Lebkuchen above, we create the walls, roof, the little door, the whole shebang. Each piece is cut and shaped to what we need, and then they are all put together. Held together with royal icing, these little houses are ready to decorate. They are made into colorful and sweet displays with jelly beans, gummy bears, gummy penguins, and more. While it's almost as much work as decorating a real house, the end result speaks for itself! Some icicles and pesky penguins on the roof! Now those are some nice houses. A full array of holiday goodies! Need gifts this holiday season? We hope you come by and try some of these classic German holiday cookies. We think you'll love them! The holiday season is known for its foods. Every culture, every part of the country—and the world—all have their own traditions, and it usually involves food, cakes, cookies, and drinks. Who doesn't enjoy food during the holiday season? But few have the history of the Stollen—or Christstollen—the delicious German fruit bread entwined deeply with the history of Dresden and surrounding areas of Germany. The Stollen is made during the Christmas season and is an integral part of any Christmas gathering for millions of people. It is so much a part of the season, in fact, it was partially responsible for a drastic change in law in the 15th century—law that required the hand of the Pope himself to modify, which is no small thing. Stollen has been around since the 1400s. Originally baked without butter, the first Stollen would taste very bland and odd to us today, but it was considered a fasting food and was designed to be tasteless. The fast was about giving up on these luxury items, after all. Bland was the whole point. Butter and milk were prohibited by the Catholic Church during fasting times, like the Advent season leading up to Christmas, since they were considered luxury items. Without butter, pastries and breads would have been quite different than what we are used to. The earliest record of the original Dresden Stollen is from 1474. From there the Stollen became an official Christmas tradition after being baked for the Council of Trent in 1545—a very important gathering in the history of the Catholic Church. The Stollen has changed over time. Originally, without butter, it was a hard and thin bread. Today we enjoy a much tastier treat, peppered with raisins, fruit, and a delicious coating of sugar. In fact, the Stollen was partially responsible for the lifting of the butter ban, and for the humorously (to us) named Butter-Letter—a letter written by the highest authority of the largest Christian church of the time, about butter. In the 15th century, Prince Elector Ernst and his brother Duke Albrecht of Saxony wrote to the then Pope, Pope Nicholas V, asking for the lifting of the ban on butter. The oil they had to use in place of the creamy butter was expensive and difficult to get in Saxony, and obviously led to a very poor Stollen. It was, in fact, made of beets. Butter, not beet oil. And thank goodness! But the Church took its ban on butter seriously. It wasn’t until forty years—and a few popes—later that Pope Innocent VIII officially lifted the ban, replacing it with an annual fee that went to building churches. With the butter-ban a thing of the past, bakers were able to make what we consider today to be a Stollen, and sweeten up the holidays. Over the centuries, Stollen have become synonymous with Christmas celebration for many around the world. Kings and princes have had giant Stollen made by hundreds of bakers at once. Large parades have been held in Germany where Stollen carried by a dozen men have woven through crowds of people. Today, it is a serious art with its own association in Germany. Just over a hundred bakers in Germany can claim to make true Dresden Stolen, and their Stolen is highly prized. We at Brandenburg Bakery bake a lot of Stollen for the Christmas season. In particular, Christstollen, which is formed like a swaddled baby Jesus, and prepared by hand to the strict requirements of the Dresden Stollen Association (Schutzverband Dresdner Stollen e.V.). This guarantees our Stollen is made like, and tastes like, the very best that would be expected in Germany. Yeah, we take Stollen pretty seriously here. And we should. There is a vast difference in quality between different Stollen, and we believe ours is the best around. It’s a long process, taking over two days. Oh, and butter. Lots of butter. And everything is made from scratch, using organic unbleached flower, candied orange and lemon peel and tasty plump raisins and currants. The first day is all about the dough. The spiced dough, mixed with cinnamon, clove, and other holiday spices has to be allowed to rest a few times before it's ready. The most important first steps are the proofing, hours and hours of it in fact. A lot of intensive little steps culminate into the perfect dough. Days before we start, we soak the raisins and candied orange and lemon peel in rum, allowing ample time for the fruit to pick up all the flavor. These rum-soaked raisins, roasted almonds, and black currants are mixed into the dough, which will later give the Stollen the delicious sweetness it's known for. The dough is separated into balls of varying sizes for the whole Christstolen and the Stolen bites. Then comes the shaping and baking. Once the Christstollen is given it's knit shape, it's baked for 35–40 minutes. The next day, all cooled off and ready to go, the Christstollen is dipped in melted butter. This is not only delicious, but helps hold the vanilla infused sugar on, giving the Stollen its recognizable sweet outer crust. A butter-bath worthy of its own butter-letter. Stollen, ready for the next step! Next comes the vanilla-sugar. We grind real vanilla and mix it with sugar for an amazing combination flavors. This delicious vanilla-sugar is what we roll the Stolen in, making sure every nook and cranny is coated with sweet goodness. It's all held on by the butter. And finally, powdered sugar tops the whole thing off. Stollen doesn't need refrigeration (and definitely don't freeze it!) and if stored in a cool, dry place they will last months, with no preservatives! This makes them great gifts, or a wonderful treat to bring to that holiday get-together with the family. Wrapped as they are in foil, and coated in sugar, they stay moist and delicious the whole time. In fact, Stollen are best after four weeks, as this lets the flavors develop. And if you're looking for a quick, sweet, holiday snack, we also make Stollen bites. Instead of shaping the dough into large loafs, we use smaller dollops to make perfectly snack-sized Stollen, in case you don't want to commit to a whole Christstollen! We only do Stolen for the Christmas season, and we stop selling them on New Year's, so come in soon and get a little piece of classic German holiday baking for yourself or a loved one! Everything at Brandenburg Bakery is created on site from scratch—cakes, pies, pastries, lunch items, soups, chocolate bars, and of course, breads. Why? Wouldn’t it be easier to just use par-baked breads shipped in a box? Icings out of a bucket? Canned fruit fillings? Pre-made soups? Sure, but easy isn’t our goal. Sustainable, classic, from-scratch baking is what we do. It’s what we enjoy eating, and what we love to create. So we want to show you how we do some of it, a report from the front lines of baking as it were. Few things make a better dessert, or compliment a meal, like a good pie. Apple, mixed berry, sugary crumb, maybe with a bit of ice cream on the side. Warm or cold, pies hit the sweet spot just right. Fresh fruits and berries make fresh pies—peaches, mixed berries, blueberries, sugarplums, these all make wonderful desserts. A great pie needs great crust, and, as usual, a fresh made crust needs very few ingredients. Water, flour, sugar, butter, and salt, with maybe a dash of baking powder and vinegar make for a perfect combination. The dough is made and rolled out into a large, smooth sheet, waiting to be cut into neat circles. The dough is cut and laid out into the pie pans. And now, the tasty part: filling! The fruits and berries for the particular pie we’re working on is loaded into the pie crust. Frankly, it looks good enough to eat, even unfinished! Then we button them all up tight with more dough, soon to be the flaky crust we all know and love. A lot of things can be done with the top of a pie, like crumbed sweet oats, or delicious crystals of raw sugar. The dough is folded by hand to give the nice, firm edges of the pie. Small scores are made in the top crust, which let’s us see what kind of pie it is later, not to mention making things look beautiful. And, finally, they are baked for 35–40 minutes, giving us the delicious pies we all know and love. Now, doesn't that look tasty! Rarely will someone wake up one morning and know exactly how to bake bread, make pastries, or turn sugar, eggs, and cream into tasty deserts. Maybe someone, at some time, like an Einstein of baking, taught themselves all there is to know about the art of running a bakery, but everyone else just had to start at the beginning. It all depends on where you live in the world, and sometimes, just what kind of baker you want to be. Every culture treats baking a little (or a lot) different. Some areas of the world have long standing traditions and divisions of labor with baking and bakeries, like Germany and France. Others, like the United States, are more fluid, with baking often viewed as a thing you do rather than a thing you are. Let’s talk about Germany for a moment. Sarah, born in Germany, and Errol, who spent many years in the country, had a very different experience with the culture of baking there than one might here in the States. In Germany, baking is a living, a life choice even. Much like the guild systems of old, there is a large and complex support system designed to teach you what you need to know, get you trained by a master of the craft, and a education in a school designed to familiarize you with the science of baking, complete with tests. Germany has two kinds of “bakers,” what we here in the States lump under one title. The baker makes breads, rolls, Danish, and the like. All things involving bread yeast, and is consumed fresh daily in a normal German diet. The pastry chef is different, focusing on the sweet side of things (not that the baker doesn’t sweeten the deal once in a while as well)—cakes, chocolates, truffles, and the insanely interesting “sugar arts” where melted sugar is formed into complex shapes like flames or crests. After high school (in Germany, there is ten years of standard schooling) you apply to be an apprentice with a master baker/pastry chef. This is like any other application process, and you better put on your game face. If accepted—something that gets harder as time goes on and the old ways of baking get supplanted by the modern worlds supermarket culture—you’re in like Flynn (Errol and Sarah Flynn, even?) and are not only accepted into the bakery as an apprentice, but automatically accepted into the physical school designed to teach the theory of baking. For the next three years, you work at the bakery under the tutelage of the master baker for four to five days a week, and one or two days you travel to the school to do the book-learning portion of the craft, which includes theory and basic business management. At the end of that three year period, you are tested in many ways. You think your finals were stressful? Try baking a number of complex goods in front of your betters, who judge your skill, and all this under a strict time limit. If you pass these tests, you are now a true German baker, ready to make your way into the important German bakery culture. The icing on the cake is all this is free, and better yet, you get paid. Not much, but as you are producing goods for the master baker as they teach you the ropes, you are paid for your time there—at least enough to keep you in bread and beer. And the schooling part is free as well, designed to train you and get you into the workforce rather than take money from you. This can be trace back to the days of yore, when medieval guilds ruled the arts and crafts of society, and well trained, professional bakers kept a city fed and healthy. But it isn’t easy, far from it in fact. You are competing with many others for dwindling spots with the masters of baking, and when you are finished, now have to work towards creating a successful bakery yourself. The system here in the States is very different, though the end results can be the same. Like most other crafts, baking and the culinary arts are taught in colleges all around the country. While not free, these classes tend to require far fewer years than becoming a lawyer or even an accountant. If you jump in feet first, you can find yourself running a bakery in just a few years. But, like anything else, it’s hugely beneficial to take some time “apprenticing” under talented bakers and getting the worldly knowledge classes can’t offer. Brandenburg Bakery has always been happy to have local, driven, and talented interns work with us as they get their education in culinary schools. One, who has spent a few summers with us, is Beccah. Beccah’s family has been in the area for a long time. She’d realized she loved baking when she was young, baking with her father—cookies and other goodies all made from scratch. A warm bonding experience, no doubt, but also the perfect way to get into real baking, and something we talked about here. She didn’t find anything that really excited her throughout her school career, until she heard about the extra classes offered for the culinary arts. She jumped at this, and never looked back. While much of the class focused on other culinary items besides baking, it was the baking that excited her most, and she applied herself to what would be her calling. After high school, she applied and was accepted to Alfred State in New York, a school with a renowned culinary program. The items made in the culinary classes are actually consumed by the other students in the college, so you make a lot, bake a lot, and actually feed others while you learn the ropes. Part of the schooling involved interning at a restaurant or bakery for credit and experience—an idea we find in cultures and countries around the world—and so Beccah hit the beat looking for a place to call home for a summer. While she had talked with a few bakeries in the area, she found the warmest welcome (her own words!) at Brandenburg Bakery—then in Jeffersonville, NY—hitting it off right away with Sarah and Errol. She started just a few weeks after. Since that time she has been an important part of the bakery, acting as Assistant Pastry Chef—a paid position, as Errol and Sarah believe work, even interning, deserves pay, much as it is done in Germany. The bakery has a lot to thank Beccah for, as the extra hands in the process has really helped during the last few years as Brandenburg Bakery picked up a lot of fans and customers. When asked about what she feels is most important to her when making the myriad goods in the bakery, she replied, “Using local ingredients, and making everything from scratch.” Quality in, quality out. Alfred State, like many colleges around the country, offer courses designed to not only teach you the craft of baking and culinary arts, but also how to run a successful business. As Beccah told me, she is taking two years for baking, and two more years for tech management and business skills. What is important here is the first two years are added to the second two years, giving her not two associates degrees, but an associates in baking and a bachelors in business—an excellent education indeed. No matter where you go to get an education, or if you just dive in and take a shot at it yourself, it’s important to understand the science behind it all. Yeast does what it does, sugar helps or hinders the process, heat needs to be applied in the right way, all based off of very understandable rules. This is what the hands-on approach—interning or apprenticing—gives someone, an opportunity to see it all happen and let it all sink in, so you can make adjustments or new recipes on the fly. It’s also a good idea to get used to the repetition of baking and preparing large amounts of the same thing again and again—something very important for any real bakery. When you make sixty cupcakes, you have to decorate sixty cupcakes, or you’re only half done! Getting so good at each step that you could do it in your sleep is half the battle, and you want to be ready to step up to all aspects of baking, including the more repetitious parts. It’s never too early, or too late, to try your hand at baking. Maybe you’re young, looking for that thing that excites you, like Beccah was when she first discovered the joys of baking. Or maybe it’s time for a change of pace in your adult life. If you love it, you can do it. Look into the education offered by local SUNY (or similar) colleges (places like Johnson & Wales University), look into taking some time to intern with bakeries in the area. Those with the baking bug can make it happen, and hey, America is rediscovering the joys of real, natural baked goods! 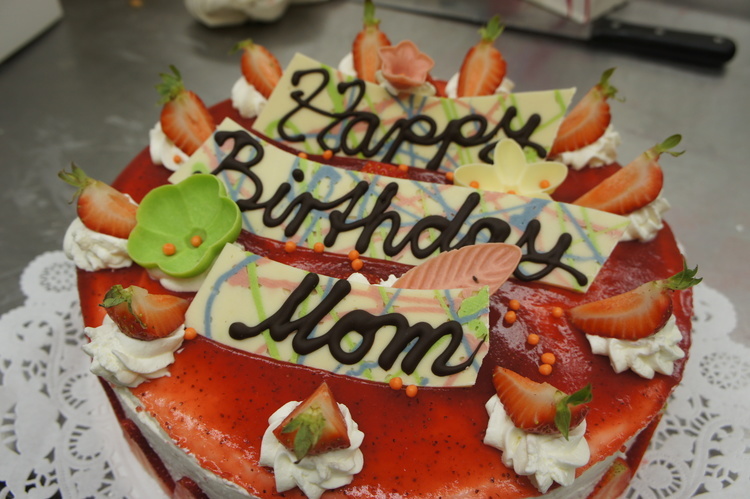 We’re asked a lot here at the bakery whether we make birthday cakes, wedding cakes, and all the other sweet goodies needed for special occasions. Brandenburg Bakery makes everything on site, with real ingredients, from scratch. Cakes are a huge part of any serious bakery, and we do them for all kinds of events. Birthdays, weddings, holidays—the 4th of July is almost here, and we’re doing special cakes just for that, which you don’t want to miss! Our goal is always to make the most delicious and memorable cake for any event. Old German baking techniques, real ingredients, and a (lot) of experience lets us create cakes that are both tasty and special. Cream puff cakes? We can do that. In fact, we do just about any type of pastry or cake you want for that special birthday, event, or wedding. We have gluten free options as well, so talk to us about what you need! Our cakes are made with a light, German style fluffy sponge and real buttercream—made by us from Tonjes milk, sugar, butter, egg, starch, and vanilla. Not only do these cakes look amazing, but they taste really good, and are light and sweet, not heavy and sugary. Birthday messages are written out with Belgian chocolate on a piece of white chocolate—a sweet message indeed. We can also do messages right on the cake, or nifty edible designs—but these take a little more time, so please let us know ahead of when you need them! But, birthdays aren’t the only time for a special cake. We’ve done cakes for Mother’s Day, Father’s Day, parties, Easter, and more. If you have an event where a cake would fit, we can make a cake for you! We make special cakes for every holiday—Easter, Father’s Day, Mother’s Day, Christmas, and all the rest—including the upcoming 4th of July. A great highlight to your holiday barbecue or gathering, we’re making patriotic cream pies, decorated with fresh raspberries, blueberries, and strawberries in flag or star design. Coconut cream, vanilla cream, or chocolate cream! Give us a call before the holiday comes around to make sure you have a sweet surprise to wrap up your celebrations! Of course, a wedding cake is a very special thing indeed. It needs to be done right, be memorable, but also enjoyable. There is no use for a fancy cake that looks nice but tastes like stale cardboard! We do tastings with the couple to wed, creating a special tasting cake made from many of the types of cakes that interest the wedding party. This lets us demonstrate the end product in person—you can taste the cakes right then and there—and this also lets us get to know you and what you want. One of the joys of working with a small, local bakery is the back and forth you can have with the people who do this for a living, instead of dealing with a dispassionate and near anonymous person over the phone. It make a huge difference when you can see each other’s faces, hear each other’s voices, and relate to one another at a real human level. A wedding is a distinctly personal thing, and every step should be personal as well. We’ve done everything from elegant, white wedding cake to inventive, eye-popping and colorful cakes. These are all real cakes, however, and can’t be made into little rocket ships or other really quirky designs. There are a lot of gimmicks used to make a cake not look like a cake, and in the end, the whole thing wouldn’t be edible. We prefer to give you the best tasting, most amazing cake—elegant or fun or anything in between—rather than an inedible sculpture best left to a museum! But there is a lot of latitude for creativity in the well-known tiered wedding cake design, as you can see from these pictures! Everything we make at Brandenburg Bakery is from scratch, using real and natural (and local, whenever possible) ingredients. This means the buttercream is real buttercream. Just as you wouldn’t leave butter, or cream, out of the fridge for hours, these cakes will need to be refrigerated and cared for the same way you would for any dairy product. Please don’t leave our cakes in the sun for cocktail hour, or display them for hours on end. The best way to have a artisanal cake is to have it as fresh as possible—from the bakery to the fridge, from the fridge to the plate, and from the plate to the tastebuds of your guests! But, in the end, these cakes will satisfy everyone. Large enough to give everyone a slice, sweet and light and made by hand with the care only a small bakery run by people who breath and dream baking can offer, these cakes make for the perfect end to a perfect party or wedding. Since everything we do is from scratch, these cakes are special in every way. No two are exactly alike, and we don’t have some hidden shelf somewhere with ready-made pseudo-cakes in little white boxes. Give us a call, or come down and visit us in Livingston Manor (make a trip of it! There are a lot of local farms, businesses, and events around our little burg!) and let’s talk about what you need. Some of these will take time. A simple birthday cake can be scheduled more loosely, of course, but something like a wedding cake will need to be talked about, tasted, and planned out a while before the big day. Good things take time! We like to plan these things out way ahead of time, weaving them into our schedule, and setting things aside as needed to make sure your cake is ready exactly when you need it. But the next time you’re planning a birthday bash, a going-away party, a retirement gala, or just want something special for that special someone, think of us and let us make it amazing! Summertime—a break from the chill of winter, and a time to be outdoors with friends and family. The sun is shining, and the grill beckons! Everyone loves a good cookout, and we all know the classic grilling m.o.—meat plus fire equals burgers and hotdogs. But, wait, what else can be done on a grill? What kind of things can we all try this year to switch things up? Make something extra special, something that grilling aficionado you work with at the office may have never tried, something delicious and different? And better yet, how do you do this with all natural and fresh local ingredients? While the word bakery isn’t the first thing to come to mind at grill-time, there are a lot of great things that can be made with our awesome breads, doughs, soups, and more to enhance your family day at the grill, not to mention the wonderful assortment of sweet desserts for after the meal! Let’s look at a few things we like to make here during grill time. Pizza Time? Yes, I Think it Is. Brandenburg bakery has some awesome pizza dough, made with sourdough, water, flour, olive oil, and salt—all natural and delicious. Flammkuchen, German white sourdough pizza, is great for grilling. We make ours with sour cream, fresh leeks and bacon from Hilly Acres Farm, a local farm just a town over the hill from us. Is your mouth watering yet? Let’s see how you can make this awesome addition to any cookout. Ingredients: Pizza dough from Brandenburg Bakery, sour cream, leeks and/or wild ramps, and bacon (pre-fried to reduce the grease left on the pizza). Maybe you want a little red with your pizza…we understand. Why not make a Pizza Margherita on the grill to really mix things up? Pizza Margherita is a simple but wonderful type of pizza. Legend has it, it was named after Margherita of Savoy, Queen consort of the Kingdom of Italy in the late 1800’s, as it was her favorite type of pizza—she had no stomach for salty toppings or anchovies. The pizza is colored for the Italian flag: green basil, red tomatoes, and white mozzarella. Of course, historians argue (that’s one of the things they love to do!) about how accurate the history of the Pizza Margherita really is…but, you won’t be worried about that when you’re out in the sun eating a delicious, fresh, and all natural Pizza Margherita this summer. We make ours with fresh, old-world mozzarella from Tonjes Farm, a local farm not far from the bakery. So, what do you need to do to enjoy Pizza Margherita on your grill this summer? Ingredients: Delicious pizza dough from Brandenburg Bakery, a cup of Brandenburg’s famous tomato soup—made fresh and quite delicious, mozzarella sliced thin, and fresh basil. Like the Flammkuchen above, allow the dough to thaw in an oiled bowl covered in plastic-wrap. A twist on the classic American hot-dogs—some German bratwurst makes for a meaty addition to any grilling you’ll do this summer. Our local , family owned supermarket, Peck’s Market (one of which is a few hundred feet from our bakery), has a good selection of German brats. Ingredients: Some nice German brats, sauerkraut, bacon and other fixings, freshly made baguettes from Brandenburg Bakery (call ahead by 24h or more and get 10% off, to be sure there are enough for your grilling needs!). Everyone’s favorite finger food: Bruschetta. It’s very easy to make, and is a perfect appetizer as the brats and the pizzas are getting all grilled up and ready. Our sourdough breads are perfect for bruschetta, and are all natural and fresh made at the bakery daily. Ingredients: A loaf of sourdough country bread, unsliced, from Brandenburg Bakery, 8 roma plum tomatoes, diced, 1/3 cup chopped fresh basil, 1/4 cup shredded parmesan, 2 cloves minced garlic, 1 teaspoon olive oil, 1/4 teaspoon kosher salt. No day of cooking outside is complete without dessert! Brandenburg Bakery has everything you need, from sweet cookies, to strawberry-rhubarb pie, all made fresh at the bakery. Brownies, danish, muffins, almond fingers: all wonderful desserts after a day of bratwurst and pizza! Why not pick up a few things to really top off the grilling experience? And don’t forget our neighbors, like Madison’s down the road, where you can get cups of amazing ice cream to top your pies and really make it a sweet end to a great day of grilling. Previously, we touched on some fun stuff: how real bread is made, and classic german baking in Sarah’s family. However, delicious fresh bread and scrumptious chocolate crumb cake aren’t the only thing we make at Brandenburg Bakery. Croissants and turnovers are examples of puff pastries: layered, tasty, often flaky, and perfect for a quick snack, or if we are talking about one of our savory spinach and feta turnovers, a great lunch. That’s right, lunch! Sausage and pepper, reuben, and spinach and feta turnovers make an excellent mid-day meal. Puff pastries are versatile things, and fairly intensive to make. The flaky, buttery textures look so simple and unassuming, but quite a few steps (and days) go into making them. What’s a puff pastry versus any other pastry? Most puff pastries have no leavening—yeast or baking powder or another ingredient to make it rise. Unlike other pastries or breads, puff pastries rise by a mechanical process rather than a chemical one. This is what gives puff pastries those flaky layers we expect from a good turnover, as opposed to the solid structure of, say, bread. However, some puff pastries do use yeast, like danish and croissants. They are still layered, and rolled and folded much the same. These layers are what really separate a puff pastry from other types of pastries—the unique textures of a croissant or turnover are very different from other baked goods. Either the butter steaming under baking heat, in the case of a turnover, or us physically rolling berries and almond paste into a long tube of dough, in the case of a danish, create these wonderful layers. When a puff pastry like a turnover is baked, the butter melts and gives off steam. This (tasty) butter steam pushes the layers apart, and infuses the cooking dough with its buttery goodness. This is why every single bit of that turnover is as buttery as any other bit—it’s a part of the very essence of the pastry. This is what gives us those individual layers of pastry, versus a lump of dough baked solid, and is perfect for holding things like berries and cinnamon. We let the butter do the work, and the lack of yeast keeps the layers thin and flaky instead of thick and doughy. This is why our spinach and feta turnover, for example, is flaky and layered. Since the puffing up of the puff pastry is because of either butter, or yeast, the ingredient list of these pastries is super simple: flour, water, salt in the dough, butter rolled in as the dough is worked (turnovers and croissants) or added into the mix (danish). In the case of a danish or croissant, yeast, and milk as well. Maybe even a little cocoa powder, if we're talking about a chocolate turnover. That’s it. Four or six ingredients. These very basic building blocks, combined with the rolling, baking, and butter sheets, are all that go into a basic puff pastry. Of course, a supermarket-bought pastry might have many more ingredients…I mean, how else is the thing going to last two months on the shelf before you eat it? But, if done right, and done naturally, there is very little in the dough—all the flavor comes from the butter and whatever filling may be in the pastry. A puff pastry, if done right, takes days to make. Each step begins with a thorough rolling of the dough, folding it over itself when thin enough, and rolling some more. Rinse, repeat, quite a few times. But here’s the catch: if you overdo this all in one day, the dough starts to break apart. Dough is held together by a fine lattice of proteins, and overdoing the rolling and folding too quickly breaks these down. Since no one wants “most” of a pastry, the dough has to sit—“rest”—between rolling and folding sessions, for at least a few hours, to regain some of the structural strength that gives us a pastry instead of a bunch of torn dough. During this process—over two days—sheets of pure butter are put on the dough, folded into it, and rolled as flat as the dough itself. Some places use shortening, or oils, or in the case of “magical mystery” canned pastries, some combination of multi-syllable chemicals, instead of butter. However, butter is the best. The taste, and the consistency, relies on good butter since the butter is the very thing that makes a puff pastry puff. Skimp on this step, and you get a skimpy pastry. No one wants skimpy pastries. We roll the butter into the dough sheet, fold it some more, roll it some more, let it rest some more, and do it all again until the layers are stacked up nice and neat. And these layers run into the hundreds. It’s a little game of baker-math (and who doesn’t like math?). If you have two layers and you fold it in half, you get four layers. Fold that, eight. Fold that, sixteen. Fold that…well, you get the picture. While most puff pastries follow these steps to a point, things get interesting just after. What makes a turnover and a danish so very different? It all comes down to these last steps. A croissant, for example, is cut from the dough and rolled at an angle, and then gently formed into the crescent shape we know and love. Danish are rolled out into a huge, flat sheet (ours is as long as our entire counter) and then filled with whatever delicious goodie is going inside—blueberries and almond paste, maybe. Then, like a giant cigar, it is rolled starting at one long side until we have a huge tube of dough and filling, to be slice into parts and baked. The rolling of the dough is what gives us those peelable layers of danish tastiness we know and love. A turnover brings out the straight-edge. The large, final flat sheet of dough is divided into little rectangles, filled, and then folded over itself—hence the name, turnover. This is what gives us the pocked of goodness inside, like our spinach and feta or chocolate turnovers. When finished, the pastries are baked, and the butter does its magic. What you end up with is a wonderful, delicious, and light treat. We think you'd be hard pressed to find better puff pastries anywhere else in the area, as Errol and Sarah pride themselves on making them from scratch, with real butter, all natural ingredients, and it shows! Come in this weekend (and any other day!) for our wide variety of made-from-scratch danish, croissants, and hearty turnovers. Blueberry, poppy seed, almond, and raspberry danish, as well as our ever-popular savory turnovers and flaky croissants, are here for a delicious snack or quick lunch! Recipes have long been one the most important things one can pass down to the next generation. It wasn’t that long ago that most meals were made at home, and pastries, cookies, and other goodies were made in the family kitchen. Often these were family recipes, perfected over years, maybe starting decades ago from some simple original recipe, but over the years added to and adjusted to suit the tastes of a family. In America, it’s been a long time since baking at home was the norm. The ready-made food explosion of the mid-century made it easy to throw a tray in the oven—later, the microwave—and have a full meal ready for the busy family in minutes. Cakes, cookies, pastries—these have been at our fingertips in this country for longer than any of us remember. Why bake when you can get that box of ever-lasting cookies (that never go stale!) at the supermarket? Sure, you can’t pronounce half of the ingredients, and there is more corn than sugar in them, but no one can argue it was convenient. Of course, a side effect of this glut of available goods is that many of us were never taught how to bake or prepare meals in any real way. An entire generation, or even two, have passed without many of us ever spending more time in the kitchen than absolutely necessary. How many can point to a old box full of index cards, each scribbled with custom recipes for cakes and muffins, hand written in hasty script, passed down to us from the generations that preceded us? Yet, many of the goods offered in Brandenburg Bakery are made from just such cards. Sarah, one of the two who own, and work at, Brandenburg Bakery, has just such a collection of recipes from a time long ago, and a childhood spent a world away from the Catskills location of the bakery. Her mother and grandmother were very good in the kitchen—not an oddity at that time in Germany. Not having access to the same explosion of ready-made foods as we were at that time here in America, a family in Germany would keep the old ways alive, with fresh foods made in the home and shared by the family. Things were made at home, daily, in warm little kitchens, all by hand and with love. All the little tweaks, the tiny changes and modifications of a recipe, survive to this day due to a grandmother’s love of baking, and a child’s love of helping. Nothing can bond the generations like time spent baking—a hands-on job made that much more enjoyable by good company, licking sweet batters from spoons, and chatting about the day’s events. In a time before internet recipe sites, before corn syrup filled foods, when flour was bought fresh and bread made daily, these recipes were perfected to withstand the passage of time—and needed to be passed down from grandmother, to mother, to child, lest they be lost forever. The difference is in the taste. These recipes, hand crafted, original, still carrying the personality and soul of previous generations, simply taste better. A simple trick, an extra dash of brown sugar, maybe a special way of rolling the dough, these things make a difference between something good and something great… The kind of great that has you thinking about that pastry days after eating it. And these things can’t be replicated, not in some factory pumping out doughnuts in white boxes. They are earned through the skill and love of those that passed the recipe down to us. The recipes passed down to Sarah from her grandmother, Ursula, are special, not just to her, but also to those who enjoy the goods made from them at the bakery. It’s a very rare thing, here in the Catskills, to find classic German recipes brought to life just the way it’s been done for a hundred years. This is something we are very proud of here at Brandenburg Bakery. Ursula loved a full house, bustling with family, and of course, children. What better way to show love than pans of chocolate crumb cake for all to enjoy? The very same chocolate crumb cake made in our bakery, in fact—and a favorite of those who try it. The Chocolate Crumb Cake, made just the way it's always been. This warm home, a farm in Germany, was where Sarah was drawn into the joys of baking, and these memories are just another part of what makes a small-town bakery such a wonderful place. The lessons learned there, taught by a woman who loves to bake, made the lasting impression that still shapes everything baked at Brandenburg’s today. Everything has just a little extra oomph, a dash of the old ways of baking, a teaspoon of that love of family baking. Another recipe perfected by Ursula, and dots the pastry case at Brandenburg Bakery, is the butter cake. Sweet dough topped with butter and cinnamon is baked just so, causing the butter to sink into the cake itself, taking the sugar with it, and creating the irresistible sweet and buttery pastry no one can say no to. Apple cake, danish, almond fingers… everything in the bakery can be traced back to classic German baking and the memories of a loving grandmother, her daughter, and granddaughter, sharing moments in the kitchen. Ursula is still baking, even today. Her friends and neighbors benefit from her skill and classic recipes, and she makes the entire building where she lives smell like sweet, baked goods. And now, when visiting, Sarah and Ursula trade recipes, perfected by their love of the craft, Ursula learning something new, and Sarah bringing even more classic German baking to the Catskills. Baking is something that can always get just a little bit better, and there is always something new to learn. And Sarah plans on continuing this with her child, in an unbroken chain of passing recipes from generation to generation. It’s a beautiful thing, and the benefits speak—or, rather, make the mouth water—for themselves. Bread has been a staple of the human diet for at least ten-thousand years—with unleavened breads, like what we know today as pita bread and tortillas, likely being made as long ago as thirty-thousand years. For many of us, this is a staggering amount of time, one that boggles the mind. In fact, bread and grain production is considered one of the major factors to the rise of civilization as we know it. That’s a pretty big deal. An invention that changes the course of an entire species is nothing to sneeze at. Today, however, we take bread for granted. It’s ubiquitous, found everywhere, thrown out, considered just the side to a nice dinner or the thing that keeps the peanut butter off our hands as we eat a sandwich. Worse yet, what many of us consider bread—the fluffy, white, fairly tasteless stuff found in bags at the supermarket—is riddled with corn syrup, azodicarbonamide (an additive used in plastic production), and preservatives. In the end, it’s hard to say if there is enough bread in these breads, once you consider all the additives, to really be bread at all. All the bread we make at Brandenburg Bakery is hand-crafted and made in much the same way as what our grandparents, and their grandparents, would have enjoyed all those years ago. Leavened bread—breads that rise, as opposed to flatbreads—are created through a process much like beer, wine, and cheese, known as fermentation. A baker will create a dough out of baking flour, water, possibly a pinch of salt, and a certain amount of yeast, and in our case at Brandenburg Bakery, an additional yeast that makes our delicious sourdough (more on that later!). Carefully mixing and shaping these components into a perfect little feeding ground for the real workhorses of bread-making, the yeast, a baker then waits for the little beasties to do their work. Much like beer and other fermented foods, bread is only possible due to microscopic organisms, these yeasts, doing what they do best—eating and releasing byproducts we want, like small amounts of alcohol and the CO2 bubbles that give bread its airy and fluffy texture. Yeasts are little machines, pulling in sugars—like the sugars that are in all starches like our flour—and converting them into a nutritious and flavorful combination of proteins and alcohols. Of course, our ancestors had no idea what a yeast was, only that when dough is created in the correct manner, inedible grains were converted into edible bread. It could have been magic or the blessings of their gods turning flour into bread. In fact, we knew very little about this process—one we successfully harnessed for thousands of years—until the invention of the microscope let us look inside our food and drink as they were made, lifting the veil on these tiny yeasts who are responsible for so much of our success as people. This makes it even more amazing to think that almost every civilization on earth discovered fermentation and its use to make bread, often separately from other civilizations, and has resulted in all the styles of bread we have today. The process isn’t very complex, but requires a steady hand and a good sense of measurement and timing. An expert baker will produce perfect bread, waiting just long enough for the fermentation—the name for what our little yeasts are doing, converting those sugars into something we want to eat—to make the dough flavorful, but not long enough for the yeasts to consume all their food and die off. This part of bread-making might take a few hours, and the baker has to stay on top of the dough, folding it, shaping it, keeping our tiny friends inside feeding and fermenting. Once the dough has been fermented, folded, and shaped, it needs to be proofed. Proofing is where the dough is allowed to ferment a bit longer in a temperature controlled environment in its final shape. This last step before baking is very important, as it’s where much of the flavor and the internal structure of the bread comes from. A well done proof will give us the perfect bread, with all the flavors and wonderful textures we want with it. And, at long last, the dough is baked into bread. This last step not only converts the soft dough into something edible, but also solidifies all the work that came before—the last of the yeast is destroyed, the latticework of gluten (a recently, and incorrectly, maligned protein we’ve been eating without problem for longer than civilization has existed) that gives bread its solidity is strengthened, and a nice crust is formed on the outside. Baking needs to be controlled, timed, and watched with precision. A baker will score the dough before baking, leaving the small “dents” or patterns on top of the bread that both serve to beautify the finished product and keep the bread from popping like a balloon during the first few minutes of baking. All of this requires care, and results in a wonderful bread, fresh and soft and ready for you to eat. All of our regular breads at Brandenburg Bakery are sourdoughs. Sourdough bread uses an additional bit of nature’s finest food machines, Lactobacillus. These little guys add flavor and break down the chains of complex starches, making for a natural sweetness that doesn’t require any added sugar. This helps keep the glycemic index down, making sourdough bread a better choice for diabetics than plain white bread (and especially supermarket bought bread-in-a-bag, which tends to have corn syrup and/or sugar added). A sourdough, whole-grain bread is as close to what our ancestors long ago ate as you can get, and is nutritious enough to be a food, not just a side-dish or extra. What many of us considered bread for the last half-century, culminating with the recent explosion of chemical-laden pseudo-breads that are sold in every supermarket in America, is actually a heavily processed product that uses tricks and chemical compounds to produce something very bread-like, but nothing like real bread at all. It’s all designed for speed and bulk, with flavor and nutrition thrown aside for the profits gained by churning out bag after bag of mass-produced bread. It starts from the very beginning: the ingredients for these pseudo-breads are grown and harvested for bulk, designed to grow faster, yield more, and are chosen for profit versus taste. Like a good beer or fine wine, the grains used in bread-making have a great effect on the end result—both flavor and nutrition. The grains are milled with an industrial process that often kills off the all-important enzymes and discards much of the grains in the process—the germ and bran, important parts of grains that humans have evolved over tens of thousands of years to digest. Again, these modified processes used to make these breads are geared towards speed, not quality. The resulting flour is known as "high gluten" flour, being made from wheat that has been modified to produce more proteins. The wheat used in these BSOs (Bread Shaped Objects) aren’t of the quality and freshness a respectable bakery, like us here at Brandenburg Bakery, would use. And, finally, all those stages mentioned above—fermentation, proofing, and baking—are rushed and “enhanced” via chemicals and tricks, leading to what we know today as the flavorless and nutrition-less plain white bread. The nutrition is so impacted by these processes, you’ll find most brands of bread in the supermarket add minerals and vitamins into their mixture to compensate, in the form of mysterious chemical ingredients. We at Brandenburg Bakery take fresh bread seriously. Errol is in the kitchen so early, even the roosters haven’t begun to stir yet. It takes time to prepare a day’s worth of bread, and since Brandenburg’s bread isn’t laced with hard to pronounce chemicals, the it needs to be made fresh every morning. The sourdough breads we make are easier to digest and affect a diabetic’s blood sugar levels less than store-bought breads. Sourdough, and fresh-made real bread, contain vitamins and minerals naturally, and are an important part of any diet. The standard white bread found in a supermarket, and even the “whole grain” breads found on the same isle, often have extra ingredients added just to give it some nutritional value. The lack of chemical compounds thrown into the mix means real bread is healthier no matter how you slice it—see what I did there? There is no place for corn syrup in bread, no need to add powders and liquids from some industrial bottle in a factory, no reason for bread to last for months on a shelf due to microbes not seeing the store-bought bread as food (since it isn’t…). Fresh, real bread is an actual food, and can sustain life without any ingredients that can’t be grown and milled in a small garden and processed with hand-tools and stone wheels. And it's important to note, our bread is made from the same sorts of wheat and ingredients humans have eaten for most of our history. Our bodies are primed and ready for these breads, which have evolved right along side us. The recent spate of real gluten allergies, as well as the thousands of people duped into thinking their particular problem is related to gluten in some way, can be linked back to the fact we are no longer eating what we've alway eaten. We, like anything on Earth, have changed in certain ways over thousands of years, and our bodies are programmed to accept certain things—and reject others, like the high gluten flour and mysterious chemical compounds in supermarket bread. The next time you’re in the bread isle at your local supermarket, just walk on by and leave the factory breads on the shelf. Brandenburg Bakery has you covered with affordable and delicious bread, whole-grain and healthy, fresh made from scratch every morning, just the way we have enjoyed bread for thousands of years!